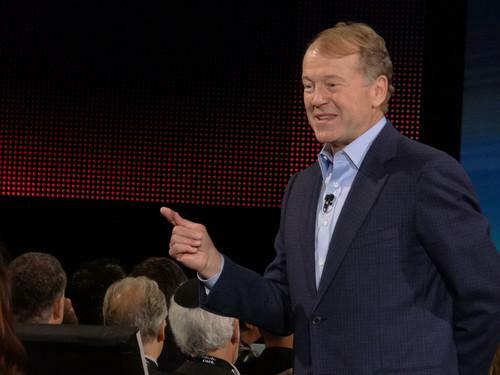 There's a big showdown coming in IT pitting no-name hardware with overlaid software against purpose-built architectures that stretch from data centers to the edges of networks, Cisco CEO John Chambers says. Most of today's top IT vendors won't be around in a meaningful way in 10 years, with Cisco -- naturally -- left standing, Chambers told a packed house at his keynote address at the Cisco Live conference in San Francisco. "You're going to see a brutal, brutal consolidation of the IT industry," he said. Many other industries will also consolidate, and enterprises will have to transform themselves and adopt end-to-end architectures like Cisco's to stay competitive, he said. Though open-source software on top of white-box hardware may cost less initially, a unified architecture saves operational cost by being simpler to set up and manage, Chambers said. "We will be the best implementer of SDN in the world," he said. "It will not only benefit Cisco. We will lead this industry." The Chambers keynote on overall business vision came on the eve of an address by President of Development and Sales Rob Lloyd, who is set to discuss Cisco's "technology and business vision" on Tuesday morning. While that lineup might suggest Chambers, 64, is getting ready to hand off the CEO role to Lloyd, he indicated last November he would stay on for two more years. Chambers has also discussed nine other Cisco executives, in addition to Lloyd, as possible successors. On Monday, his familiar stagecraft was fully on display, with several forays into the audience and confident predictions on the future of IT and of Cisco. Chambers is still gunning for the top spot in tech as a whole, even as its financial results take a dip. While citing relatively flat revenue at Hewlett-Packard and IBM as signs those traditional tech giants are fading, Chambers acknowledged Cisco has some work to do itself. The company has marked year-over-year drops in revenue and profit for the past three quarters. "Watch how we bounce back," Chambers said. It won't be by selling higher volumes of routers and switches but by building full architectures for enterprises and governments, and through software and services such as Cisco's InterCloud offering, he said. Even the so-called Internet of Things -- or the Internet of Everything, in Cisco-speak -- is more about getting the right information to the right people than about connectivity, Chambers said. However, in several examples of IoT architectures he frequently cited the company's hardened edge routers with built-in Linux computing capability. Chambers also highlighted a hardware introduction Cisco made on Monday, demonstrating the DX80 videoconferencing system. Remarkably like larger versions of the cancelled Cius tablet, the DX line of devices are essentially large-screen Android tablets designed for use on one employee's desk or shared around an office. Typical selling prices of the DX 80, which has a 23-inch touchscreen, will be around US$2,000, he said. The companion DX 70 has a 14-inch touchscreen and a list price of about $1,000. The DX80 was part of a demonstration of Cisco technologies in a fictional rail system, where sensors, cameras and small routers in cars and alongside tracks collect data for use in managing the railroad. The DX80 was used to assist a ticket buyer via a video kiosk in a station.